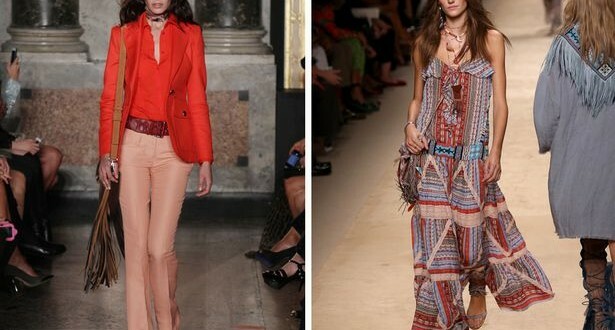 For an easy wardrobe update, swap your skinnies for flares. They are flattering on curvaceous hips, so give them a go. Layer on stone pendants and gold tassels for that haute hippie vibe. The peasant blouse does wonders for your wardrobe. For a pretty take on summer dressing, pair with a button-detail denim skirt. It’s all about ‘touch me’ textures – invest in fringing, suede and everyday denims. Print is big when it comes to nailing this trend, but be sure to only stick to one piece to avoid a visual overload. Go for a silky blouse or tunic top.